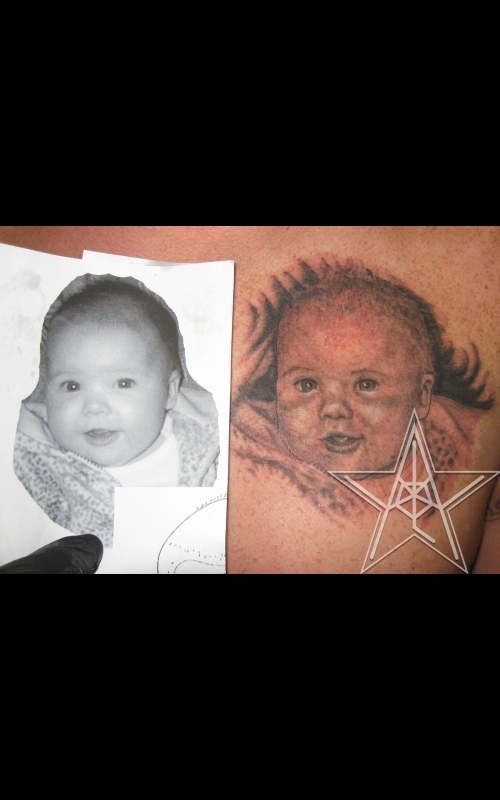 Remember the Beach Black and Grey portrait tattoo of a child and footprints in the sand. 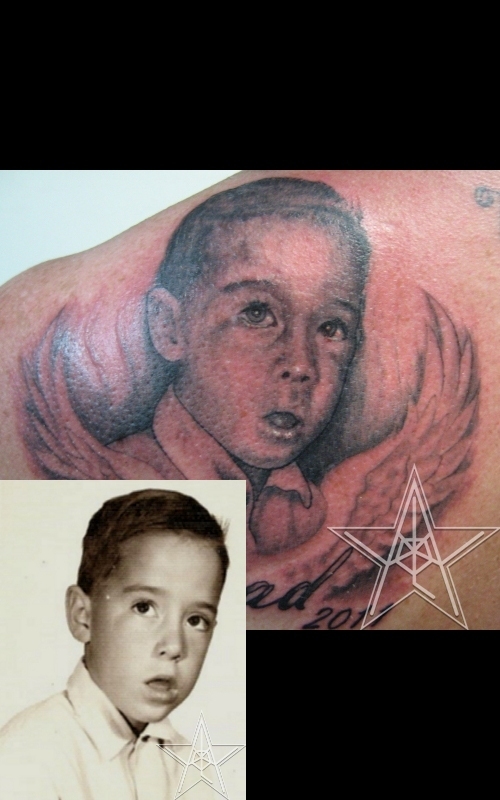 The Son's Father Black and Grey portrait tattoo of man's father as a child. 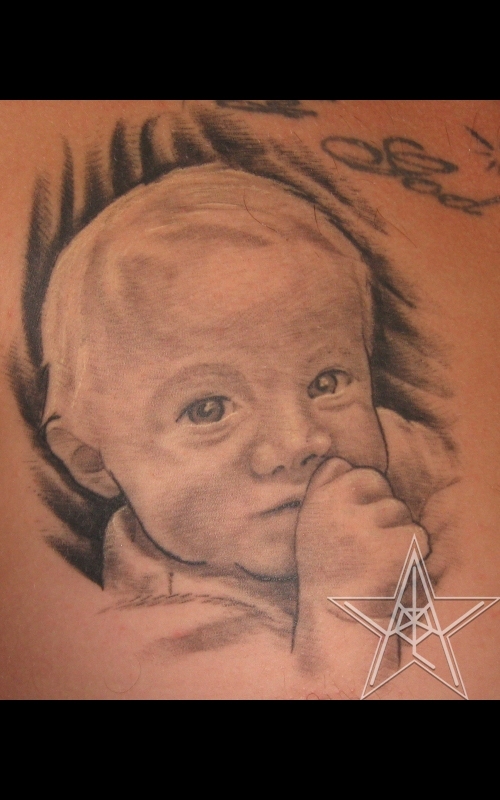 Forever Snuggly Black and Grey portrait tattoo of a child in memorium. 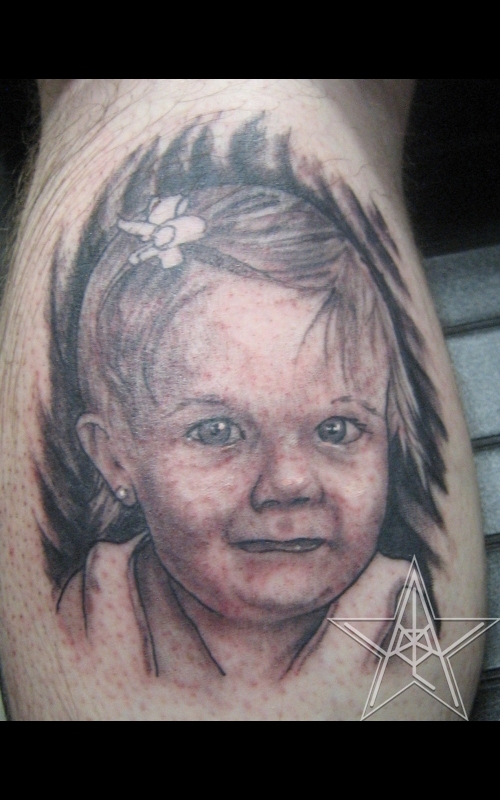 Tasty Fist Black and Grey portrait tattoo of a child. 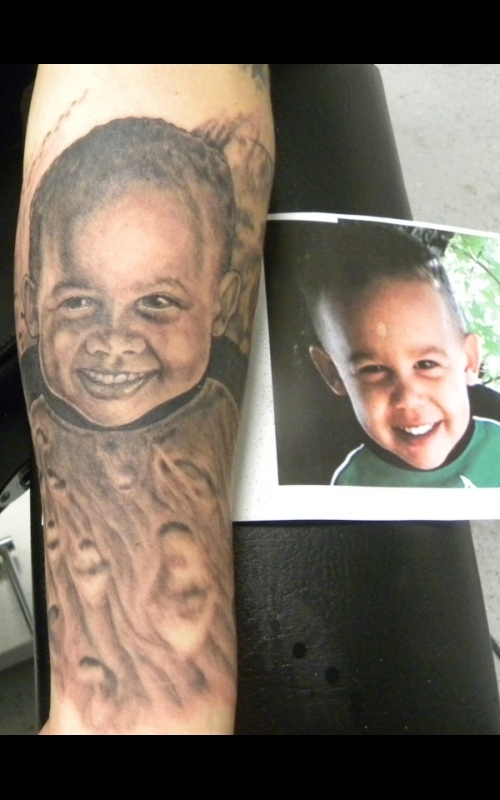 Happy as Can Be Black and Grey portrait tattoo of a child. 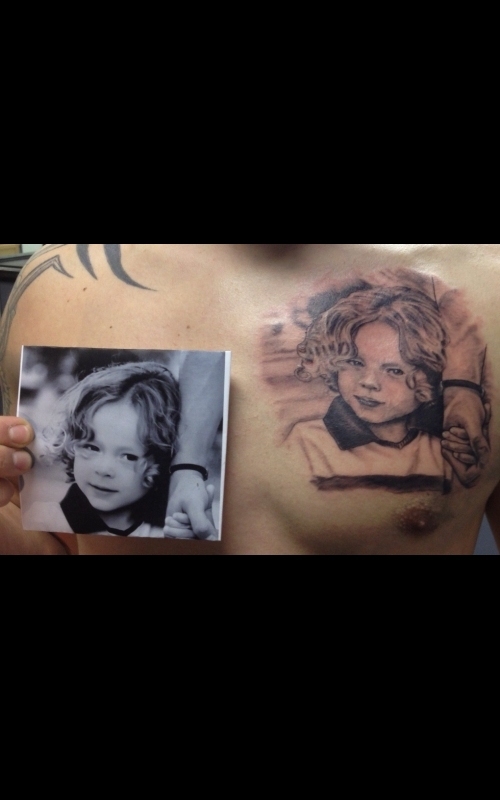 Hangin' with the Pops Black and Grey portrait tattoo of a child holding his father's hand. 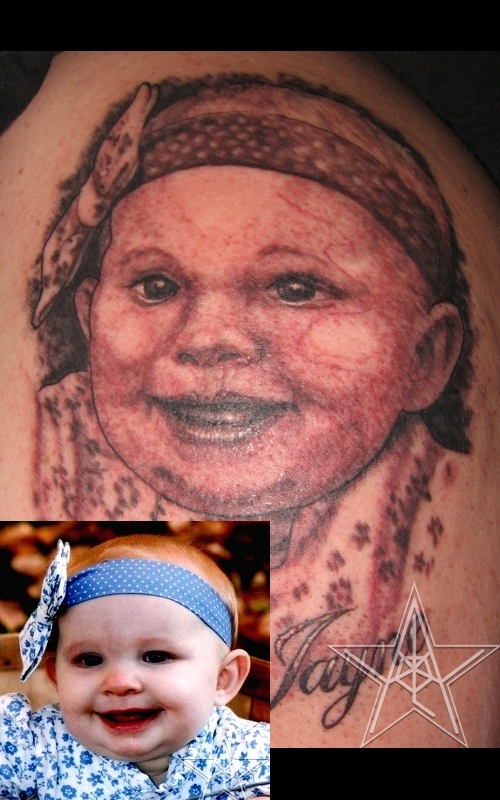 Tee Hee Hee Black and Grey portrait tattoo of a smiling child. Tell Me Not to...I Dare You. 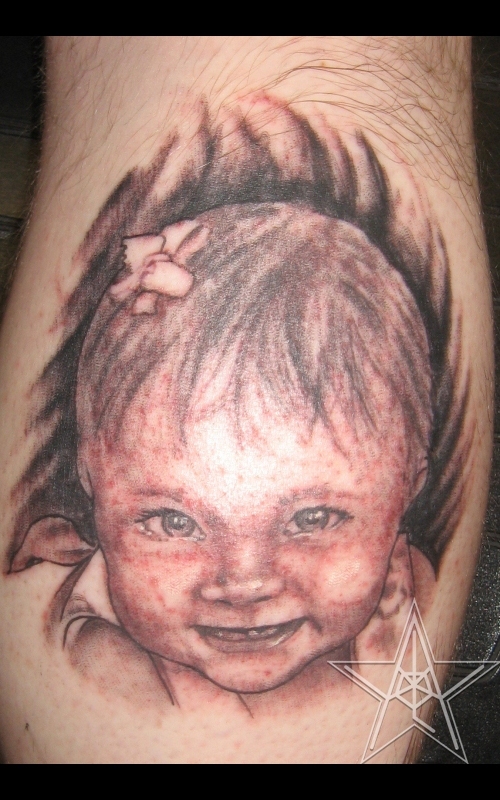 Black and Grey portrait tattoo of a grinning child. 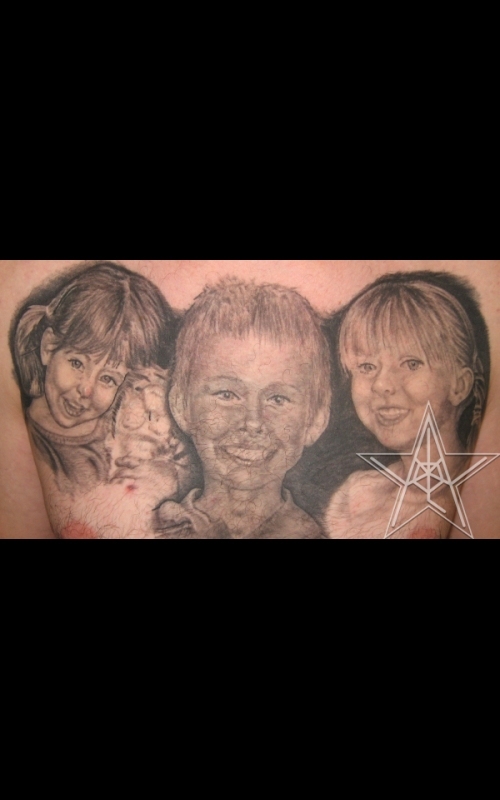 All My Children Black and Grey portrait tattoo of children. Walking the Tracks Black and Grey portrait tattoo of a child on railroad tracks. 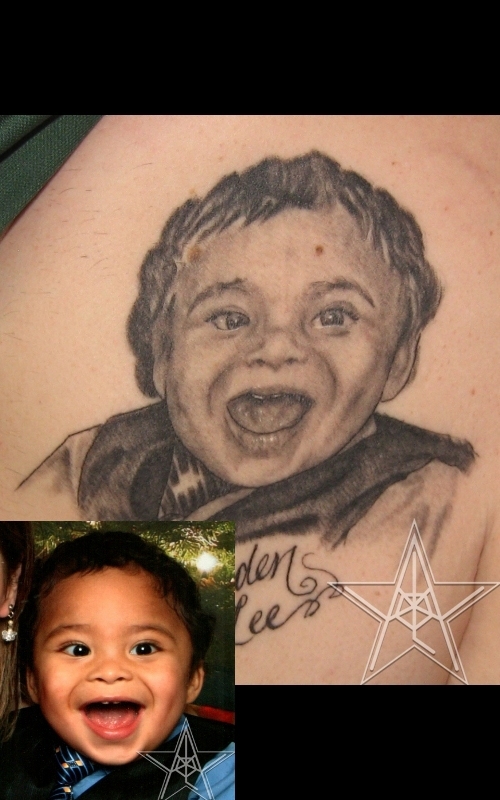 Kiersten Smiles Black and Grey portrait tattoo of a child. Lettering is repair work. All Wrapped Up Black and Grey portrait tattoo of a child with a bow. 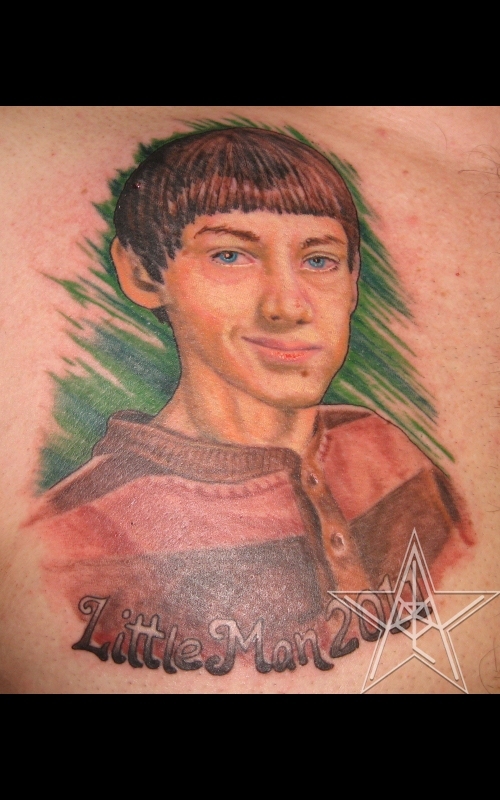 Thataboy Color portrait tattoo of a young man. 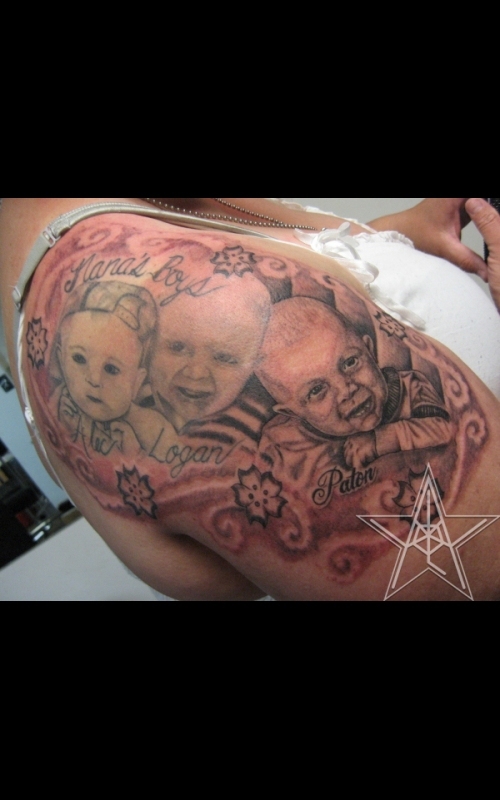 The Grandkids Black and Grey portrait tattoo of children. The two on the left were done elsewhere in Muskegon. 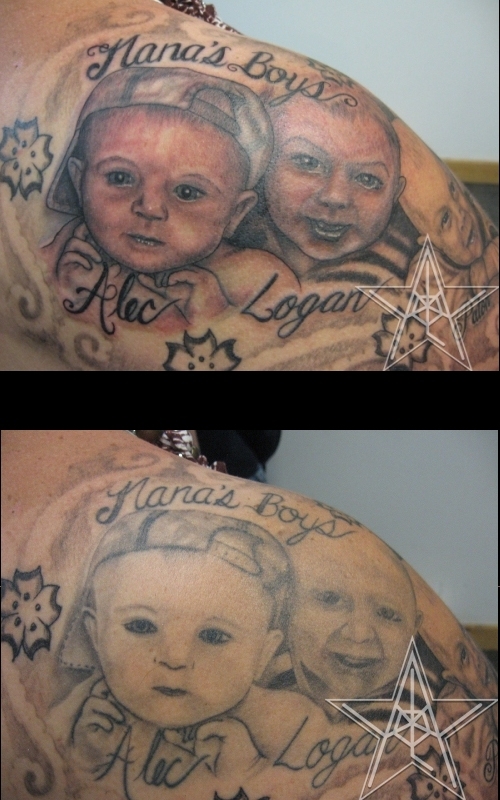 The Grandkids Reborn Black and Grey portrait tattoo repair of children. 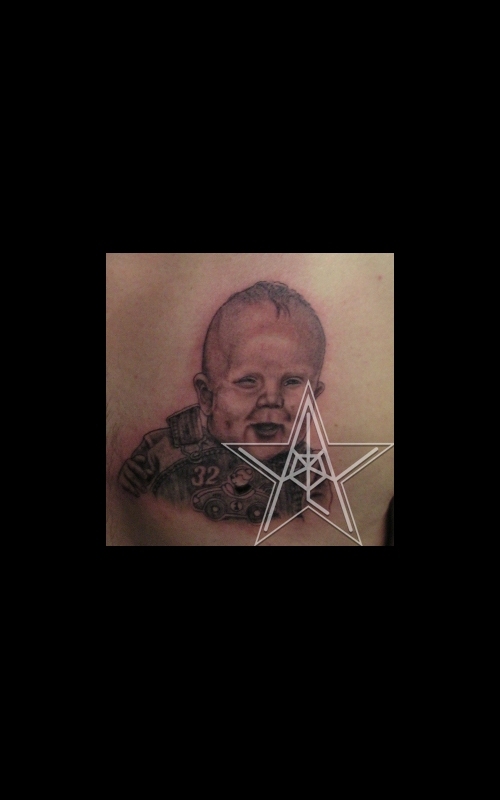 Racin' Overalls Black and Grey portrait tattoo of a child. 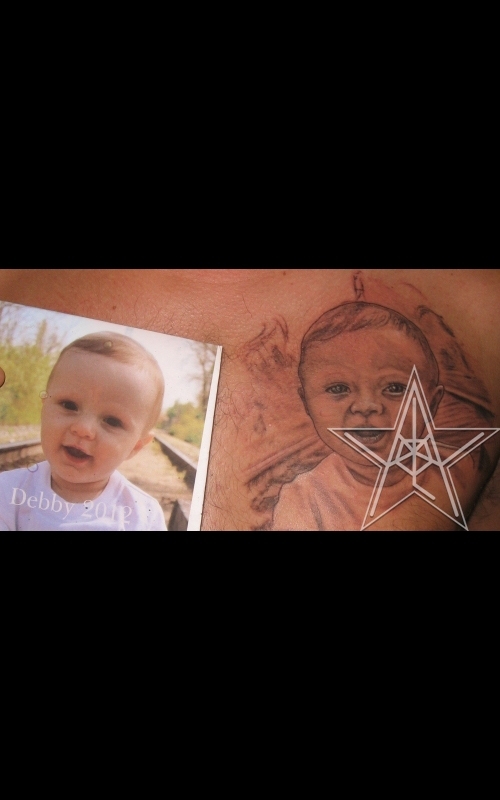 Children's portrait tattoos by Ray Reasoner Jr.